Kim Kardashian has dared to straighten her daughter's hair. She has received a lot of flak for this act. Kim Kardashian is pregnant via surrogate with her third child, but she's still having a baby shower. North West was the cutest guest. North West sings "You Are So Beautiful" to Kim Kardashian in this super sweet Snapchat video. Awww! Kim Kardashian Responds to Outrage Over Putting North in a Corset! Kim Kardashian was spotted with North West and it appeared that North was wearing a corset over her dress. Kim tweeted out a video explaining that North was not wearing a corset. Kim Kardashian has shared this video in honor of her daughter's fourth video. It's pretty gosh darn adorable, even the harshest Kim critics must admit. North West turns 3 today, so mom Kim Kardashian shared a video of North promising not to grow. Other family members joined in to wish the toddler a happy birthday. Kim Kardashian filmed her daughter, North refusing to have her picture taken on Instagram. The little girl yelled "no pictures!" while covered in a fur coat. Kanye West Surprises Kim Kardashian With Orchestra Serenade for Mother's Day! Kim Kardashian awoke to an string orchestra playing show tunes for Mother's Day, all courtesy of Kanye West. North West and Penelope Disick are adorably tickled pink in their flower crowns in a video Kim Kardashian shared to Snapchat. Kim Kardashian revealed recently that North West made her stop breastfeeding Saint West. That toddler wields a lot of power. The Kardashians took a trip to the LA County Museum of Art, and at one point North West fell while playing with an interactive exhibit. 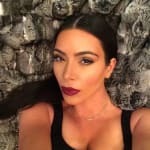 Her mom, Kim Kardashian continued looking at her phone, unaware of what happened. North West and Penelope Disick play with Kanye West dressed as the Easter Bunny during a Kardashian family gathering.